A casual combo from yesterday. The weather was around zero degrees Cesius when me and my girlfriend were on a walk. I wanted to have something sort of smart, but still casual and with some nice rougher textures. I was wearing my unstructured navy cotton wool jacket, white oxford cotton spread collar shirt, washed Incotex chinos and brown Meermin longwing gunboats. 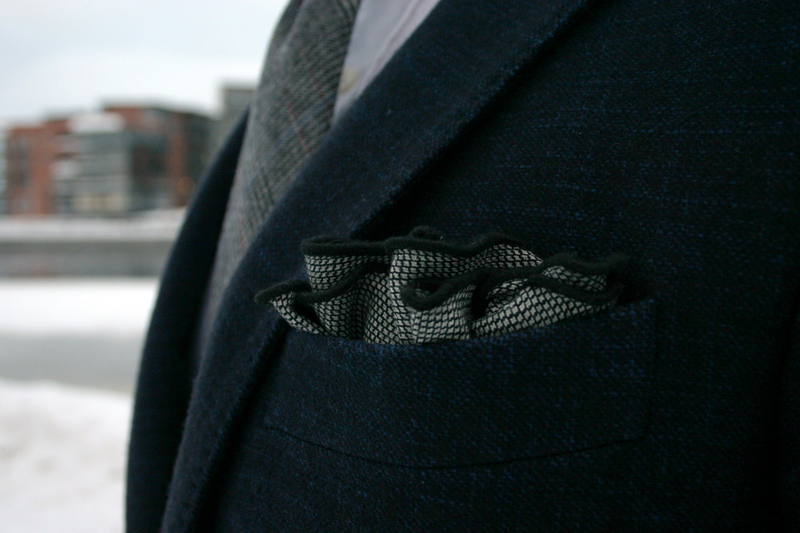 Accessories include a grey Prince of Wales check wool tie from Berg & Berg, a round wool pocket square, Equus Leather bridle leather belt and navy wool socks. Navy wool hat from Nollakolme Tampere and a grey peacoat to keep me warm. 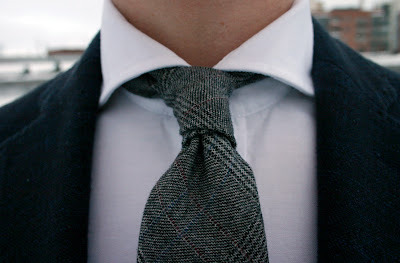 This unlined tie has been great. Good for almost any kind of outfits, and the semi-soft wool is just great for the season. I got this square from Barney's summer sale for just 5 dollars. There is no tag, and I've seen the same product for some brands for a $70 RRP so I think made a good deal. 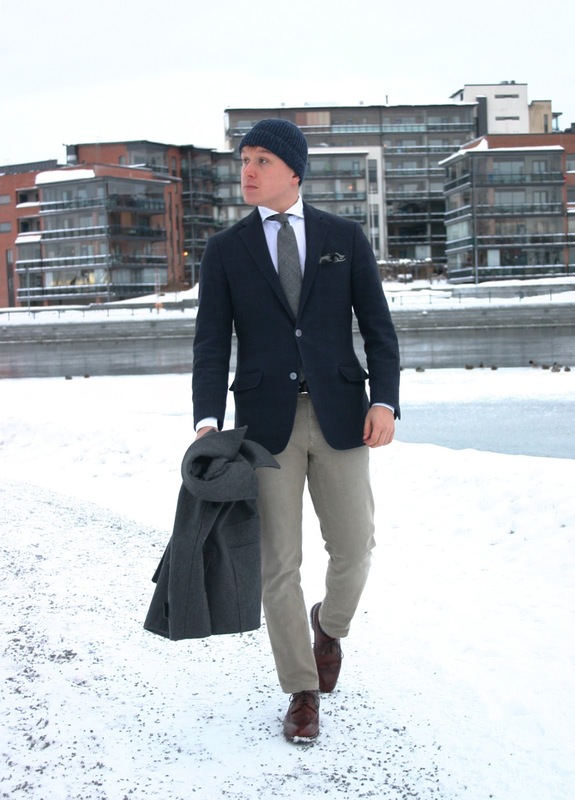 The thick and washed chinos in a semi-dark khaki color are a pair I bought especially for this kind of outfits. Most of my other trousers in similar hues have been altered to a slightly more dressier fit and have cuffs, not to mention their more "sleek" fabrics. So, for these a bit rougher combinations I couldn't wish for better pants. I think a black bowler hat might be more appropriate here. Thanks for your comments again. However, I think that would be a bit out of place here. Also, a wool hat like this is really the only kind of hat I would wear. Hello! Nice blog you have going here. A question for you. When you say "altered to a slightly more dressier fit", what does that entail exactly? I recently bought several trousers and would like to have them tapered (if necessary) and hemmed to the correct width and height. This is trickier than it seems (too narrow and it looks clownish or girlish, too short and the pants won't go with certain shoes, too long or wide and it looks sloppy) and any tips you have would be appreciated. May I ask: your preferred width (measured flat across the hem), whether you taper at all, and your shoe size? It might also be helpful to know your height generally! Keep up the sartorial splendour and that distinctively Finnish smile! These are with, but the same width. My shoes are mostly UK7 or UK7.5, but some are UK8 depending on the shoe. And I'm roughly 175cm. My preferrance is a lot slimmer than many people wear themselves though. I'm 178 cm with roughly size 10 (US) shoes and usually wearing pants size 32W/33W and 29H . As such I'm a little reluctant to taper below 19 cm. One other question: Do Incotex trousers stand out for any particular reason (compared to say Banana Republic khakis)? I've seen them mentioned in various style blogs but never in person. 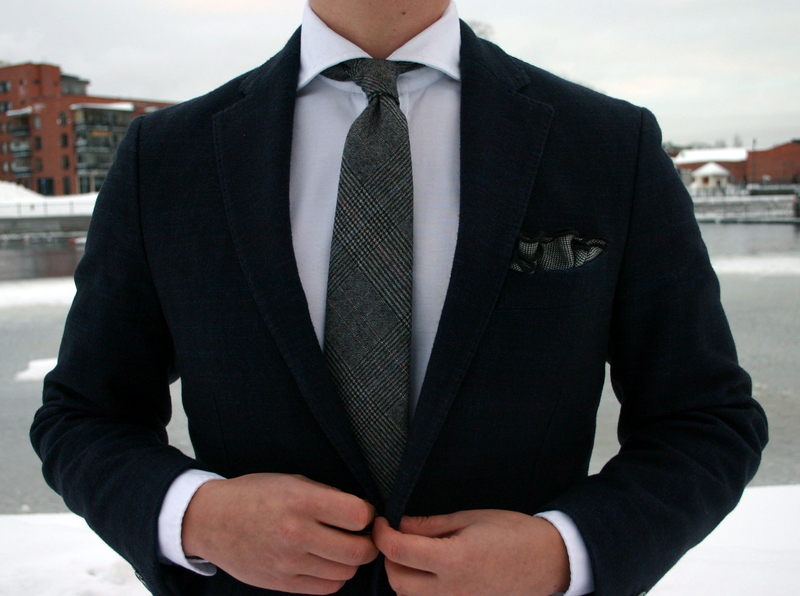 I would say that the slimness of your outfit and different pieces should always follow your proportions. A heavier or wider (be it fat or a sporty frame) person can't really have the leg opening much under 19-20cm, and the shoes should be picked accordingly. A very narrow sleek lasts are very hard to pull off if you are a wider person. For example, many atheles have so massive tighs that I could never see a very slim leg working for them. 16,5cm is where I've come to after years of looking for the right measure. 17cm starts getting too wide for my shoes, and 16cm is too small to put my feet through. 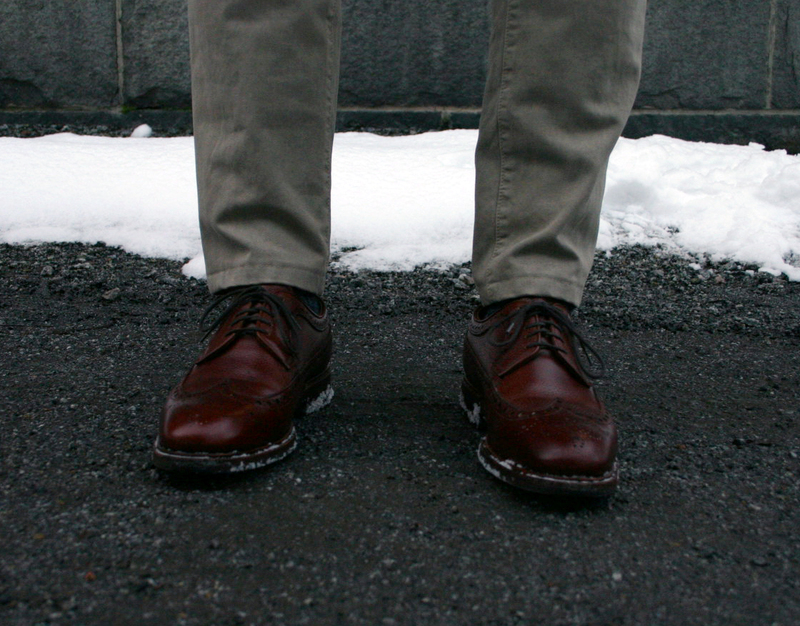 Also, cuffs and pressing make the leg look slimmer (and better looking in my opinion) and fit the shoe width better. If you look at my pictures, I use this 95% of the time.